Sweet nose, honey, custard notes,candy corn, but also caramel, and wood influence. Coconut,and tobacco. Sweet like chocolate, raisins,brown sugar, woody spicy, oak, anis chilli, liquorice. Added water : fruit and more sweetness.Ginger cake,pears,honey cake. Spicy also. Middlelong. Sweet and fruity. But also spicy notes. 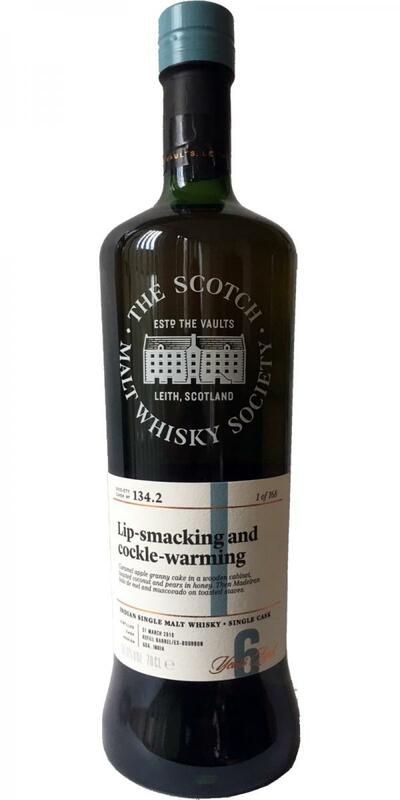 https://www.smws.com/whisky/latest-outturn/lip-smacking-and-cockle-warmingThe initial nose is sweet (honey, custard donut, candy corn, caramel apple granny cake); then the wood influence comes – wooden cabinets, toasted coconut, dusty tobacco). The palate also has initial sweetness (pain au chocolat, chocolate raisins, brown sugar), followed by big woody spice (oak, anise, chilli, liquorice). The reduced nose continues that duality – sweetie necklaces, pears in honey and ginger cake against wooden shelves in a shoe shop and pipe racks. The reduced palate is similar, but somehow more integrated – Madeiran honey cake (bolo de mel), bourbon biscuits, Oddfellows, sweet chilli and muscovado on toasted staves – lip-smacking, tasty and cockle-warming.